“Shall her soul live on within this diamond”. ABEER manifested as quintessential elegance. Modernistic lines combined with timeless style. Created with a 4.00+ Carats Round Brilliant center stone surrounded by two tapered baguette diamonds, ABEER is a dichotomy of design elements. A combination of strength and subtlety. The ring is set with three Signature Stone® elements that mimic the silhouette of the main stones. The 18K Yellow Gold feels like the warmth of her blonde hair and radiant smile. With strong Platinum, SARAH was named after her. Handcrafted with a stunning 6.00+ Carats Oval Cut diamond of the most respective “make”, this two-tone design is set with a three-row band of Colorless diamonds (D Color/Internally Flawless Clarity). At the heart of this ring sits a stunning Fancy Pink Argyle® Oval Cut diamond Signature Stone®. With strong lines of a 5.00+ Carats Radiant Cut center stone set in Platinum combined with the soft tone of 18K Rose Gold, PRISCILLA is a geometrical finesse. The entire ring is set with the finest grade of pavé diamonds: D Color/Internally flawless with excellent Cut, Polish and Symmetry. The Signature Stone® element was custom-cut to mimic the shape of the diamond center stone with a Pink shade that melts into the Rose Gold of the band. All diamonds are rare, but only some are irreplaceable- just like her. 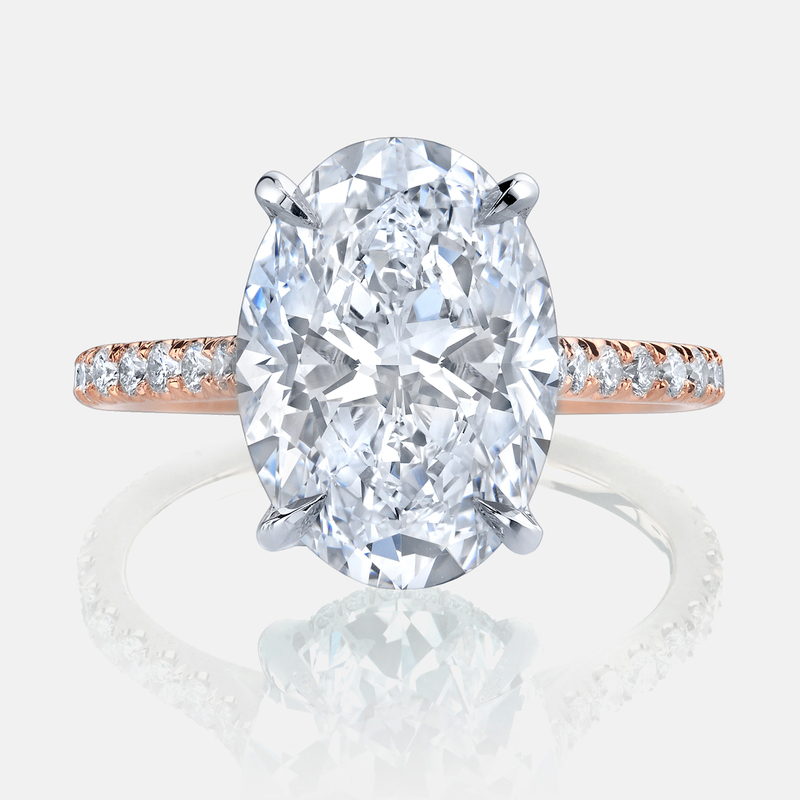 Francesca was created with a perfectly graded D/Internally Flawless five Carats Oval Cut diamond. Set simplistically with Rose Gold and finished with a Fancy Intense pink Argyle diamond Signature Stone®, the warmth adds an edge to the elegance. Simply breathtaking. Heart-Shaped diamonds are rare and romantic. ALENA was named after Her and was set with a 8.50+ Carats Heart-Shaped diamond. The ring’s head was created with delicate Platinum prongs while the lower part was crafted with 18K Rose Gold to reaffirm the delicacy of the main diamond. Jean Dousset curated the perfect Signature Stone® element: a rare, natural, Heart-Shaped Pink Argyle® diamond. The entire ring is set with Colorless (D Color/IF Clarity) pavé diamonds. Unique, classy, unexpected…this is ALENA. In Greek Mythology, she was the Goddess of Reason, Wisdom and the Arts. She remains a powerful motif for the power and strength possessed by women of all kinds. ATHENA was named after Her and created with these symbolic references in mind. Set in a Micro Seamless Halo™ to showcase its beauty, this 5.00+ Carats Cushion Cut diamond center stone has a memorable “make”. The craftsmanship and details were pushed to great extents with slightly tapered stems and an eternity-set, three-row band. Since the day she could imagine designing her engagement ring, the Emerald cut diamond was at the forefront of her vision. Our HALLE design is chic and sophisticated- just like Her. HALLE transforms the classic iteration of a three-stone diamond engagement ring by adding the Jean Dousset trademark design element, The Signature Stone®, and an Asscher Cut held by two tapered baguettes. When the fluorescent Colorless White diamonds intertwined with the soft Fancy Argyle® Pink diamonds…IRINA was created. Two precious metals, 18K Rose Gold and Platinum, accentuates the brilliant color of the stones. Perfect harmony and playfulness brings back warm memories from the past. Nostalgic of all things good and hopeful of the future. NIKKA is a melodic and naturalistic flair. The ring is telling us a story. Fine pavé diamonds are like exquisite petals on a flower intertwined with its roots and stems. At the center of this beautiful composition sits a Cushion shaped diamond set into a delicate Seamless Halo™. Pure poetry. Inspired by the most famous mice of all time, ASHLEY features the silhouettes of each characters’ head, including a bow detail for her. This magical ring is set with various precious and semi-precious gemstones: blue sapphire, green garnet, white diamonds on one side and amethyst, ruby and white diamonds on the other side, to replicate the iridescent fireworks admired at Disney’s park. To add a level of detail, this custom creation also includes a beautiful Round Brilliant Cut aquamarine Signature Stone®. The first words that come to mind when thinking of Jehee are subtlety and delicacy. Her ring is a reflection of her divine personality. Set entirely with Fancy Intense pink Argyle diamonds paralleling the contour of the 18K Rose Gold band, Jehee reveals a perfectly shaped Oval Cut diamond. Pure elegance. With diamonds symmetrically lined up like dreamy tulip fields, Kathryn was inspired by this visual and features four petals in the ultimate see-through design. Kathryn is ethereally set with a Cushion Cut center stone in a unique Seamless Halo™, revealing all the beauty and sparkle of the diamond’s pavilion. A beautiful Pink Sapphire sits light and soft as its Signature Stone® element. The sparkling arches of the Eiffel Tower are a special motif to the couple. NICOLE replicates this architectural element with four flared pavé diamond stems that create an elegant and harmonious piece…visually stunning and well-refined. This illusion was created by a delicate Cushion shaped Seamless Halo™ with a beautiful Round Brilliant Cut as its center diamond. A pink Argyle® diamond Signature Stone® provides the final detail. Named after her, Grace was inspired by her magnetic personality and beauty. Deep, gentle and sophisticated. The blue Ceylon Sapphire is surrounded by our Seamless Halo™ of rare, natural, Fancy, Argyle Pink diamonds. Unconventional in the most sophisticated way. Three carat Round cut diamond with expansive scintillating facets was perfect for this signature Seamless Halo™. The four stems have tapered arches of pavé diamonds underneath the center stone, revealing the depth of its facets and leading to her birth stone, an Emerald Signature Stone®. The challenge in designing APRIL was incorporating her favorite flower, the Lily of The Valley, in the most tasteful way possible. Four small petals set entirely with the finest diamond pavé connect at the center by a deep green Emerald Signature Stone®, giving the brilliant design extra meaning to the couple. The key to create Sunbal was to expand the scintillation of the perfectly shaped, slightly rectangular, Cushion Cut diamond. The double-row Seamless Halo™ follows the exact contour of the center stone, revealing four tapered arches of pavé diamonds leading to a pink Sapphire Signature Stone®. Kacey was inspired by her favorite flower, the Japanese Cheery Blossom. The goal was to reproduce these white and soft pink tones seen in the existing flower that symbolically represents their love. Each of the petals connecting the band of the Seamless Halo™ is set in Rose Gold and Fancy pink Argyle diamonds while the heart of the flower is from an Oval cut White diamond Signature Stone®. The femininity of the Rose Gold and the Fancy Argyle Pink diamonds combine melodically with the strength of the Platinum. Xuan, whom embodies both of these characteristics, inspired this Seamless Halo™ design. The Fancy Intense Pink Argyle diamond Signature Stone® adds a gentle touch. Victoria was designed to be very personal in reference to the client’s admiration and love for her grandmother. She chose to represent this relationship with her favorite flower the Orchid. Pavé diamonds are like petals connecting the band on the Seamless Halo™ while the Oval cut pink sapphire Signature Stone® reflects similar coloring as the beautiful Orchid. Vanessa is tall, slender and beautiful- just like the ring we created for her. The craftsmanship is light and sweet like her personality with a touch of passion and fire reflected in the Ruby Signature Stone®. The eternity-set pavé diamond band completes the elegant design. Rose is named after the little girl who lives in Paris and inspired this design. A five Carat, perfectly-proportioned Cushion-cut diamond sets a vintage flair and je ne sais quoi allure. This architectural three-stone custom design is sweet and pretty like Rose. Abby wanted her ring to have a touch of art nouveau flair which was attained by including a fluid decorum underneath the center stone. The engagement ring is set in 18K Yellow Gold, as were a lot of art nouveau jewelry creations, and features a Seamless Halo™ surrounding its Oval cut diamond center stone like a pillow. Irene was named after a very creative, resourceful and talented seamstress. She loved tailoring colorful dresses for her granddaughters and re-imagining their style with each of her creations. The Signature Stone® reflects her favorite color. The focus of the design is primarily on the quality and the beauty of the Fancy Vivid yellow diamond center stone. The double-row Seamless Halo™ symbolizes him and her, and the side row of diamonds gracefully completes the creation. The four stems are tapered arches of pavé diamonds leading her favorite color- a pink diamond Signature Stone®. Jewelry should look just as pretty from discrete angles as it does when you stare straight into the show-stopping stone. This perspective embodies Tammy by revealing deeper beauty the more you discover her. Graceful and intricate, the Fancy Yellow Cushion cut diamond is set with our Seamless Halo™ of white diamonds and a round aquamarine Signature Stone®. Deep blue Ceylon sapphire was the starting point of Laurie’s design. We searched to find the perfect stone with great depth and rich, royal blue color build with contrast, length and a perspective revealing the center stone’s saturated luster. The design inspiration emerged from glamorous glitter and was handcrafted based on our classic four stem architecture. Each of the stems is comprised of three graduated Round cut, Bezel set diamonds to add a level of complexity. The band is eternity-set with three rows of diamonds and personalized with an Emerald Signature Stone®.